Ram Pothineni's Hello Guru Prema Kosame (HGPK) and Vishal's Sandakozhi 2 are set for grand release on October 18 and they are likely to take a toll on the collection of Jr NTR's Aravind Sametha at the box office. Aravind Sametha Veera Raghava (ASVR) starring Jr NTR and Pooja Hegde has collected Rs 120+ crore gross at the worldwide box office in five days. The movie has recovered nearly Rs 73 crore for its global distributors, who have shelled out Rs 91 crore on its theatrical rights. The movie is expected to earn another Rs 12 crore to them by the end of its opening. A strong word of mouth is expected to help Aravind Sametha return 100 per cent of distributors' investments along with some profit share in its second week. But the Trivikram Srinivas-directed film is facing a threat in the form of Hello Guru Prema Kosame and Sandakozhi 2, which are set to force it out of some cinema halls and also become the first choices for some filmgoers. Hello Guru Prema Kosame is a romantic comedy film, which is about an easygoing youngster and his quest to win over his ever so sensible lady-love. Ram Pothineni, Anupama Parameshwaran and Pranitha are seen in the lead roles in the movie, while Prakash Raj, Mahesh Achanta, Sithara, V Jayaprakash, Krishna Murali Posani, Satya, Suresh and Ram Prasad essay supporting role. Hello Guru Prema Kosame has been written and directed by Trinadha Rao Nakkina and produced by Dil Raju under his banner SVC. Devi Sri Prasad has composed music for its songs, which have impressed the viewers and generated a lot of curiosity about the film. Moreover, the flick has received a U certificate from the censor board and it is set to be a grand treat for the family audience this Dussehra weekend. 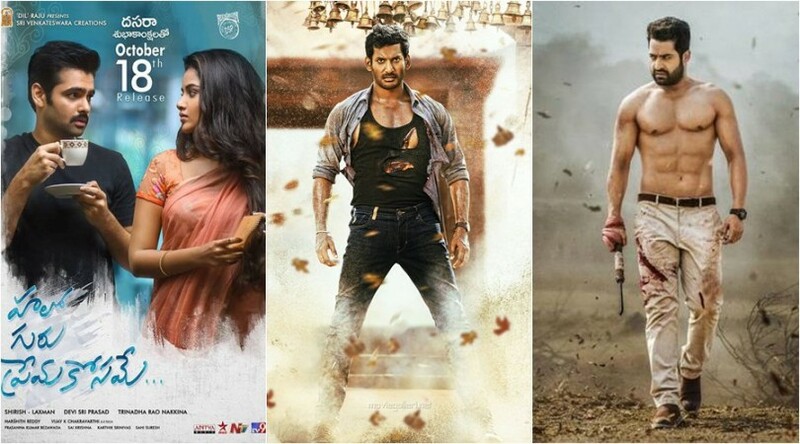 Sandakozhi 2 is a Tamil action thriller film, written and directed by N Linguswamy. It is a sequel to hit film Sandakozhi (2005) and it features Vishal and Keerthy Suresh in the lead roles. The makers have planned to dub and release it in Telugu as Pandem Kodi 2, in a bid to cash in on the popularity of the lead pair in the Telugu states. It will eat away the share of Aravinda Sametha to some extent.